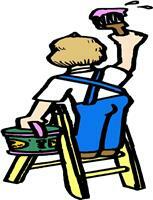 LA Pickard - Painter/Decorator, Plasterer based in Byfleet, Surrey. My name is Leigh and I have been a painter and decorator for 30 years, I specialise in paint finishes and small patch repair plastering jobs. I have been local to the Byfleet area for 14 years and have a large client base within a 10 mile radius. I am able to confidently advise you if required on how to achieve the desired finishes you are looking for in paint effects, wallpaper quality & makes, plastering or filling etc. I usually work alone which helps keep my costs down and maintains the quality, but I have access to good quality help for larger jobs when required i e taking down, re-boarding and skimming of ceilings etc or large stairwells. I do inside and outside decoration including preparation, treating and making good of windows, soffits and fascia boards. I have also been recommended in other well known quality standards magazine. I am used to working in a variety of different environments i e flats/houses, commercial residents and care homes, so am able to work around your needs and busy lifestyles, as I am often left unaccompanied when working, have access to keys and am trusted to lock up when leaving, but this is off course up to you, I also leave the area clean and tidy each day.